I have always thought that it is unfair that George W. Bush left office with the lowest poll numbers since Nixon and with a consensus by presidential historians that he was a failure as president. I would not say that Bush was the greatest president in American history, or even that he deserves to be rated among the top ten. Still, he was not a failure. If Bush’s media coverage had not been so unrelentingly negative, he might been more popular when he left office. If the media did their jobs and actually covered President Obama, instead of being his lap-dog, it is likely that Obama’s favorability ratings would be even lower than Bush’s. As for the historians, it is obviously too early to make any sort of balanced assessment of Bush’s presidency and I think that his low ranking among historians is more a reflection of their political biases then any considered reflections on his presidency. 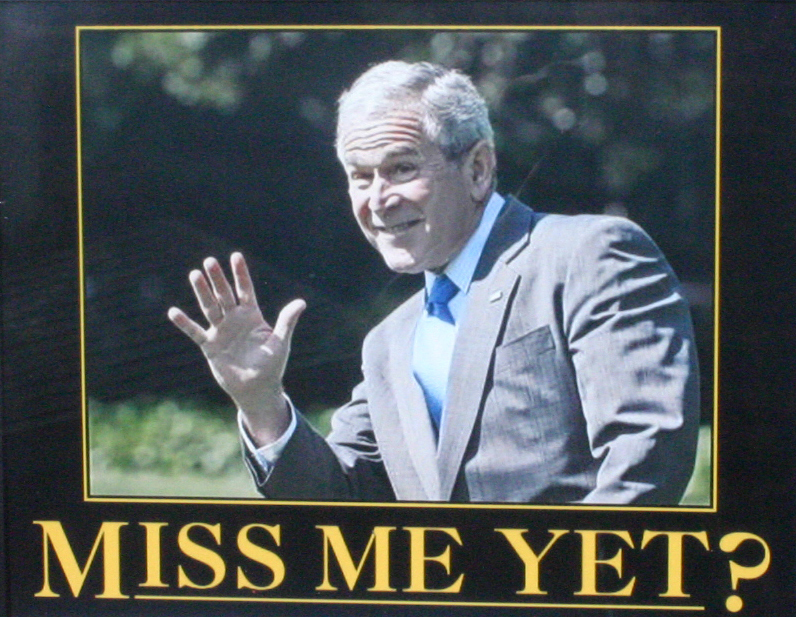 I have also thought that over time, the public and historical perception of George W. Bush would improve somewhat. Harry Truman was also very unpopular when he left office, yet many people today regard him as one of our better presidents. I thought that this process might take somewhere between twenty and fifty years. It seems, however, that the public perception of George W. Bush is improving more quickly that I expected. Bush’s presidential library opens this week, and his approval ratings are up, according to the Washington Post. Much of the reason for this improvement in Bush’s ratings is due to his decision to stay out of the public eye. Bush hasn’t been aggressively promoting himself but has stayed at his ranch. He does make speeches, etc, but he seems content to no longer be at the center of things, and maybe that is not something he ever really wanted. Of course, no matter what happens, the liberals are going to hate George Bush. They can’t live without hatred. Another reason might be that compared to his successor, Bush’s record doesn’t look at all bad. And, say what you will about Bush at least he didn’t feel the need to apologize for America to every tin-pot tyrant and Muslim terrorist. Go Ahead, Admit It: George W. Bush is a Good Man (1800politics.com) That is another factor. In his personal relations, Bush seems to be a genuinely decent person. America’s Baffling Historical Amnesia: Suddenly President Bush’s Approval Ratings Are the Same As Obama’s (alternet.org) Or, maybe Obama happens to be a worse president. This entry was posted on April 23, 2013 at 7:48 pm and is filed under History, Politics, What's Happening. You can follow any responses to this entry through the RSS 2.0 feed. You can leave a response, or trackback from your own site.